The Joomla! 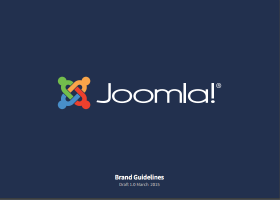 Brand Manual is a tool to help guide and strengthen the body of visual communications that will build Joomla! into a highly recognized and respected brand. The essential elements provided and discussed in the manual bring dimension and foundation to our brand, while allowing the creative flexibility needed to create communications which address the product and marketing of Joomla! For most cases involving the use of a Joomla! logo, excluding uses by the Joomla! Project, a "Conditional Use Logo" should be used (for "Conditional Use Logos" click here). However, there may be some circumstances in which the "Limited Use Logos" may/should be used (images of these logos seen below). Permission will not be granted to use a "Limited Use Logo" on any form of merchandise. The official Joomla! Shop is provided for this purpose. (You can visit the Joomla! Shop here). Permission will not be granted for use in association with any product that violates the Joomla! license or any domains that distribute such products. The first choice should always be a "Conditional Use Logo" (for "Conditional Use Logos" click here). "Limited Use Logos" should use only the official logo colors listed in the Brand Manual. Other than the variations listed in the Brand Manual, the logo may not be modified in any way. Whenever possible, the logo should appear in its full color horizontal gel version. When the gel version cannot be used, a solid color version is available. For all other usage requirements for "Limited Use Logos" please see the Brand Manual(above). Please note however that some of the text in the current document does not reflect the current trademark policy of the project. This policy is described below and in the links referenced. The pdf is only definitive for the design aspects of logo use. We encourage you to learn more about our trademark policy and to get answers to some frequently asked questions about trademarks. To lodge a request to use the "Limited Use Logos," please fill in this form. If you have received permission to use a "Limited Use Logo" you may choose from the assortment of them seen below as long as you use them in accordance with the guidelines described in the Brand Manual.